Our restaurant, formally known as the PRATA SHOP was not the first of our business. Our story goes way back to the 1950s. We are the fourth generation of the family coming into the business. In the 1950s my great-grandfather used to run a restaurant together with with my great-granduncle. At the age of 20 my grandfather came to Singapore to join his dad in business. He learned the skills at a very fast phase. When my great-grandfather left to India, my grandfather started his own restaurant at Tanjong Pagar named “RAMAKRISHNA VILAS”. He went through many hurdles back then. In 1983 the restaurant location was claimed by the government and he started “NEW INDIAN” restaurant at Maxwell Road the very same year. That too did not end up well for him; he suffered losses which forced him to sell his landed property to settle debts. He then started another restaurant at Jalan Kayu. My eldest uncle Ramanan who just finished his national service also joined the family busines. This is when our business picked up and became promising. Unfortunately, in the 1990s that area was claimed by the government too. The restaurant was then shifted to Sembawang and subsequently to Ang Mo Kio. 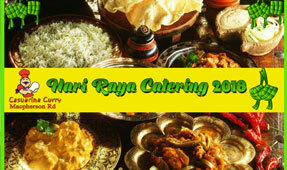 On 1st January 1993, CASUARINA CURRY opened its doors at 126 CASUARINA ROAD. If you have been wondering about it why we have that name, you know it now! We then shifted to the currently situated 136, 138 Casurina Road. Casuarina Curry has been the pride of our family. We have been recognized by the media including the Straits Times and Mediacorp. We have also represented our nation for “Singapore Day” which has been celebrated in countries like New York, China and London. We have also made Pratas for our previous and current prime minister during the swearing-in ceremony.